BoxingScene.com has been advised that the recently announced showdown between David Benavidez and Ronald Gavril, who will fight for the vacant WBC super middleweight title, will take place in Las Vegas on September 8th and will headline a PBC on Bounce TV card. 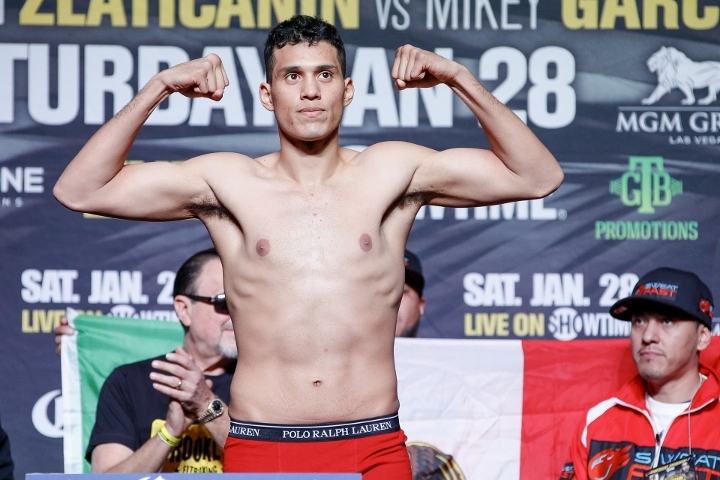 Benavidez (18-0) was originally scheduled to face Callum Smith for the title that was vacated by Badou Jack when Jack decided to move up to the light heavyweight division earlier this year. Smith dropped out of the fight and joined the World Boxing Super Series super middleweight tournament instead, and faces Erik Skoglund in the first round next month. Benavidez last fought in May when he stopped Porky Medina in 8 rounds. He will become the youngest super middleweight champion in history at 20 years old if he comes out with the victory. Gavril (18-1) is promoted by Mayweather Promotions and has won 7 fights in a row since suffering his only profesional defeat. Unbeaten super middleweight prospect Caleb Plant (15-0) advised BoxingScene.com that he will face an opponent to be determined in the co-featured bout. In other news, BoxingScene.com has also been advised that Alex Martin (13-2) will face Bryan "Goodfella" Perrella (14-1) in the Fox Sports 1 co-feature bout underneath the Devon Alexander-Martin Castillo headliner in Orlando, Florida. Martin will be looking to snap his two fight losing streak while Perrella will be looking to bounce back from his only career loss.